On the eleventh anniversary of 9/11, our nation was once again attacked. 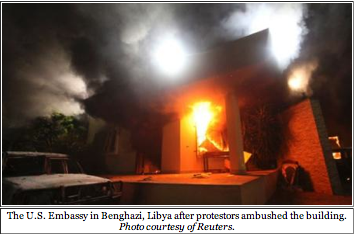 In Egypt, protestors stormed the U.S. Embassy, and in Libya, our Ambassador, Chris Stephens, Air Force veteran Sean Smith, and former Navy SEALS Glen Doherty and Tyrone Woods were brutally murdered. The terrorists immediately justified the attacks by blaming a movie. Make no mistake: this is simply an excuse by those who despise Americans, our values, and human life. Anti-American protests spread to Yemen, Iraq, Pakistan, Sudan, Morocco, Tunisia, and even London. We have been tested by terrorists in the past and the United States has responded. When America is attacked, we must respond. This past week’s events remind us that Osama bin Laden may be dead, but the fight against terrorism is not. We must bring justice to the terrorists because justice is what we do in America. The U.S. must hold those who attack us personally accountable. The message to terrorists should be clear—leave us alone. If you attack America, we will come find you. The turmoil in the Middle East begs the question, who are our allies? It’s time that the U.S. rethinks its foreign policy with Benedict Arnold nations and rethinks its foreign aid. We should stop paying countries that betray us; they will do it for free. Along those lines, I recently introduced a bill, H.R. 6391, to remove the major non-NATO ally (MNNA) status from Pakistan. This status grants important privileges, such as certain foreign aid and defense cooperation benefits, including expedited arms sale process and a U.S. loan guarantee program to help finance arms exports. Why should we show favor to a country that does not deserve it? Too many of our own men and women have died because of Islamabad’s treachery. P.S. Don’t forget about the upcoming deadline for applications for a U.S. Service Academy. Applications must be submitted no later than Monday, October 12th. Click here for more details, or call 281-446-0242 for more information.